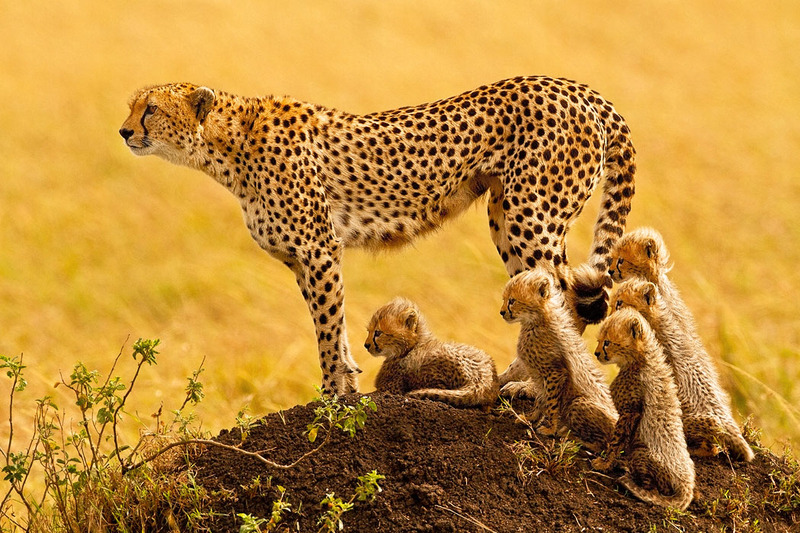 This beautiful cheetah (Acinonyx jubatus), a protective mother of five, watches cautiously from atop a termite mound as two lions slowly approach her family through African grasslands. She stands ready to protect her young cubs...at any cost. With exceptional eyesight, this excellent mother can evaluate danger from great distances. In the wild, cheetah cubs have a high mortality rate due to predation by other carnivores. The cheetah is naturally adapted for its environment, and being the fastest land mammal on record, able to cover distances up to 500 meters in bursts of 70-75 mph, it has the ability to protect and provide food for its young. In this case, the lions were chased off and the cubs and mother were able to continue with their pursuit of living wild and free.